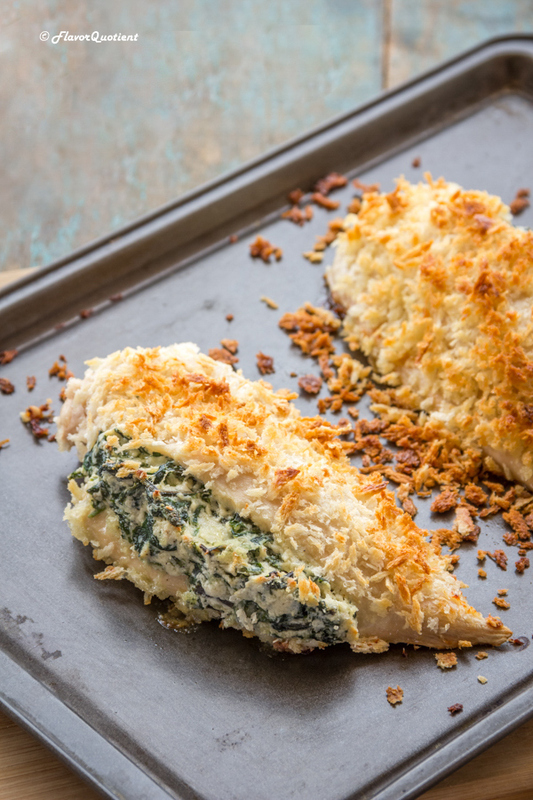 This fancy baked chicken breast stuffed with ricotta and spinach will elevate your homely meal to a rich fine-dining experience! This fancy recipe was on my to-do list for way too long and I was not sure if I would be able to pull it off well. But it was finally time that I brush off my fear and proceed towards success. You may find it weird to be scared of something so silly like trying a new recipe, but it really happens with me. Like dinner rolls for example; I so much want to make them but could never gather that courage for going ahead with it! Someday! For today, I have this fancy recipe for you which turned out really good eliminating all my anxiety. Recipes like these, when pulled off successfully, make me feel accomplished! Since the time I have set out on my second spell of active blogging, my oven is not getting any rest. Honestly! I was always fond of baked/roasted stuff and it makes it much easier to cook up beautiful meal amidst the hectic schedule of a week day. I have many, and I literally mean many, amazingly flavorful baked or roasted recipes lined up for you which will make you a pro and will take away even the slightest inhibition from your mind if, just in case, you are intimidated with this technique of cooking. Like I am with making dinner rolls! 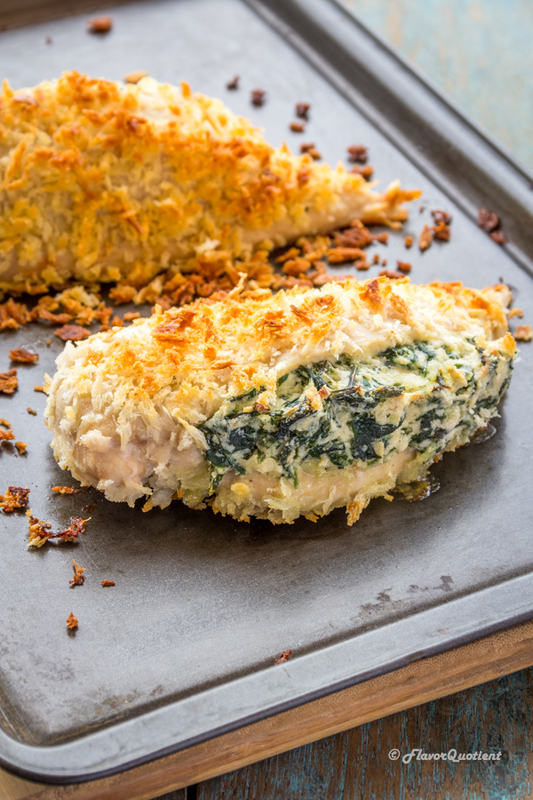 Baking the somewhat boring chicken breast makes it surprisingly juicy and moist. I generally do not like chicken breast pieces in my curries and save them for special recipes like this. 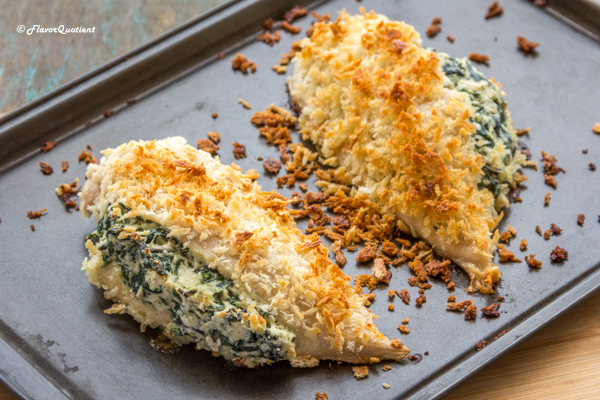 Even if you don’t like the bland taste of chicken breast, still you will fall for it as the fresh homemade ricotta with fresh spinach stuffing makes the chicken breast incredibly juicy and full of absolutely mind-blowing flavors! We made one mistake though! While we were scanning through the photos of this baked chicken, we realized that we had clicked them only on the baking sheet after it was just out of the oven and NOT after serving it beautifully on a platter! It’s only me who is responsible for this miss! I became way too excited upon seeing this glorious thing that I completely missed out on the actual planning of the perfect composition which I usually do with my all other recipes. I felt somewhat bad about it but if you guys like this one, I can pass it off as a negligible human error which happens with all of us. So promise me that you will let me know how it turned out with you! Pre-heat your oven to 200 C / 400 F and place the wire rack at the lower level of your oven. Put the fresh spinach leaves in a large bowl of boiling water to wilt for about 10 minutes. Drain and run through cold water for couple of times, then squeeze out as much excess water as possible. Chop them up and set aside. In a bowl mix ricotta, lemon zest and plenty of seasoning. Add the chopped spinach leaves to it and mix well. 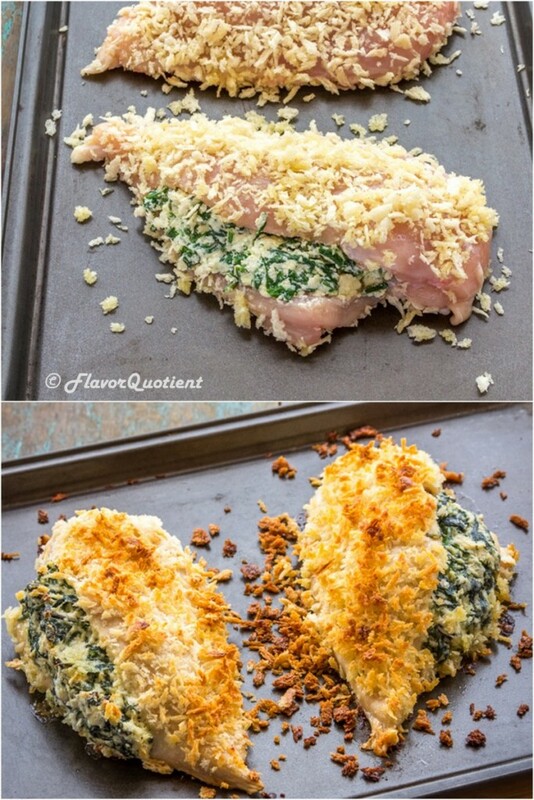 Using a sharp knife, cut a slit into the side of each chicken breast and use your fingers to make a little pocket. Spoon the mixture into the 2 breasts. 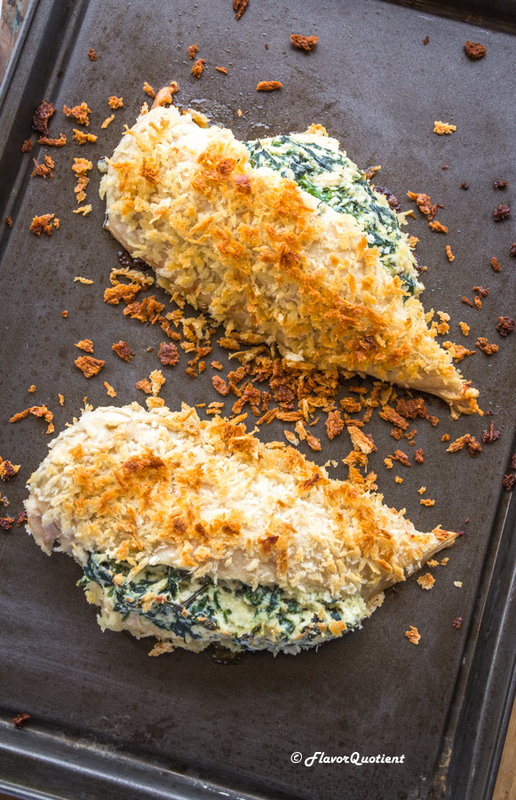 Rub the top of the chicken breasts with olive oil and press the panko breadcrumbs on top. Finally arrange the chicken breasts on a roasting tin. Bake the chicken for around 30 mins or until the thickest part of the chicken registers a temperature of 75 C / 175 F in an instant thermometer. Remove them from oven when the chicken is cooked through and the breadcrumbs are golden. Serve warm with some baked veggies of your choice! You have used homemade ricotta here. please let me know how to make that in home. dying to try this out. Recipe calls for zest and juice of one lemon, but you don’t indicate what to do with the juice. I assume you add it to the spinach/ricotta mixture; hopefully that won’t make the filling too runny! For added flavor, add some Parmesan cheese to the stuffing. Also, you might use Italian flavored Panko or regular bread crumbs; drizzle them with some olive oil. This will enhance browning.